Students practise how to write the countries and nationalities. 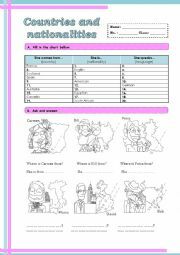 They also practise the verb to be and how to answer to some basic questions. 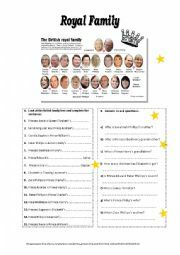 Students learn about family relationships and the royal family members. 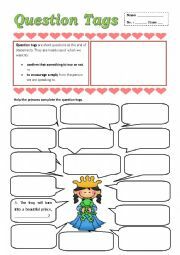 Students help the princess to complete the speech bubbles. Students complete the bubbles using the correct question tag. Students complete the speech bubbles, using the correct question tag.